GeekDad.com , whose tagline is “Raising Geek Generation 2.0”, is a website where self-proclaimed geeky parents write about their geeky interests as they relate to the raising of their hopefully geeky children. The blog is routinely seen as a beacon of family-friendly geeky goodness. From making it on Time’s “Best Blogs of the Internet” list to winning a Webby for the People’s Voice Award for best parenting blog, there is no doubt GeekDad has proven itself to be a valuable resource for geeky parents everywhere. While their list of accolades is commendable, it is their writers who make the site what it is. 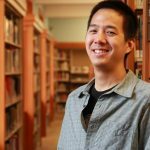 Today, we focus on Jonathan H. Liu, Senior Editor of GeekDad. Jonathan played board games as a kid and when he was in college, but it wasn’t until he moved to Portland, Oregon in 2003 that he became heavily involved in designer board games. He was introduced to Settlers of Catan and Carcassonne, but it was Carcassonne that really grabbed him. Soon thereafter he fell down the rabbit hole that is BoardGameGeek and his interest in games only escalated. After the rich gaming culture Portland afforded him, moving to Tribune, Kansas in 2007 was quite a shock. No one there had even heard of Settlers of Catan much less wanted to play board games. To cope, Jonathan ended up starting a board game group for local high schoolers, which thrived because it gave teenagers something to do other than repeatedly drive up and down Main St. Parents and other adults would occasionally stop by to play games, but it was the students who kept the group going. A few years after Jonathan moved to Kansas, GeekDad held a call for new writers. They wanted to know two main things: what kind of geek are you? what kind of dad are you? At the time, Jonathan had three things going for him: he was a stay-at-home-dad (something no one was on staff), he lived in a small town in Kansas (somewhere no one else lived), and he wanted to write about board games (a topic no one was really covering). The job was his. After two years at GeekDad, he became the Senior Editor because, as he joked, people were tired of having him send e-mails about grammatical errors in other articles and decided to give him the power to edit the articles on his own. Each month, Jonathan writes about twenty posts. Though he has considered doing video reviews, it’s easier for him to read a review than to watch a video. He doesn’t always have a lot of time during the day, so he tries to keep that in mind when writing. He makes sure his reviews can be easily skimmed for relevant information. If people have time to read the detailed review, it’s available. If not, they can skip to the sections they want to read. When preparing to review a game, he tries to play it three to five times. He’ll never write a review of a game he didn’t like based upon the first play. It’s very important to him he makes sure he didn’t miss something. It’s not uncommon for him to write to the publisher to ask if his experience with the game was “normal” and adjust the next play accordingly based on feedback. Similarly, he won’t write overly enthusiastic reviews based on just one play. Again, he wants to make sure he understands the complexities of the game. Jonathan’s reviews have been heavily linked to Kickstarter the past couple of years. Understandably, the hard deadlines imposed by a campaign sometimes place constraints on his review process. And, while he sometimes misses playing a finished game, he really enjoys reviewing Kickstarter games. He likes that people using Kickstarter for their projects think of GeekDad as a place to go to review their game. Being able to give publicity to people who don’t have a huge budget makes the lack of final art or polished game pieces okay. Jonathan is happy to support it because he is extremely grateful for being part of GeekDad. As a stay-at-home dad, he misses having colleagues. Writing for GeekDad has created a community he is able to interact with regularly. When still in Kansas, it allowed him to enjoy living in a tiny town while still being able to geek out over board games. GeekDad continues to open a lot of doors for him “to do cool things” such as going to GenCon, doing interviews, and trying out things he wouldn’t have necessarily been able to before. These days, Jonathan is back in Portland. He’s still writing about board games, though he also writes about books. In addition, he hosts Bounded Enthusiasm, a podcast “about books, games, apps, and anything else he feels like talking about at the moment” as part of the GeekDad Podcast Network. While he doesn’t regularly talk about Nutella on his podcast, he is definitely pro-Nutella. His daughter has a nut allergy, but fortunately hazelnuts are okay. When asked if he had a favorite recipe, he laughed and said, “I mean, what else do you do with Nutella? You just eat it, right?” His preferred method for optimal Nutella enjoyment? Tiny breadstick crackers that are apparently difficult to find. It is LudiCreations’ policy to never give money to anyone who reviews a game for them. However, if you would like to learn more about GeekDad’s fundraising efforts, visit the following page.